The LG DLEX3875W electric dryer has many special features. It has a wide range of 14 drying programs that can handle anything from Delicates to heavy duty garments. With its TrueSteam Technology, wrinkles and odors are vastly reduced making ironing almost obsolete. The SteamFresh Cycle on this dryer takes only 20 minutes to reduce wrinkles and refresh clothes. It vastly decreases time it takes for a person to get ready while not compromising the quality of drying. TrueSteam Technology produces real steam, reducing the need for actual ironing by eliminating odors and wrinkles while still in the dryer. And if ironing is still needed, especially for the crisper fabrics, the EasyIron Option would lightly moisten the garment and make for a more efficient and hassle-free ironing. Static cling is a special problem that most people encounter with dryers. ReduceStatic Option that does away with this problem, leaving static-free clothes. The SteamSanitary Cycle does things previously thought impossible, like laundering kids' toys or throw pillows. Anything marked as non-washable can now be sanitized using steam. The Electronic Control Panel with LCD Display makes the front of this dryer more elegant and user-friendly. Instructions as well as the diagnostics of each cycle are shown here. The state and status of each cycle is no longer a mystery while still providing that modern and sleek look. The NeverRust Stainless Steel Drum is efficient and durable choice, letting clothes dry properly without showing any sign of damage. The appliance still looks brand new even after ten or so years of use. With its porcelain top plate, painted steel cabinet, transparent door glass, and chrome door rim this steam dryer could fit with any home decor. Total capacity: 7.c cu. ft. Treat various fabrics with equal care and luxury with the DLEX3875W dryer's extra cycle options. You can now work with any type of cloth your clothes may possess. Leave your drying to the dryer with its moisture sensor that automatically shuts itself off when clothes are deemed dry. Have the option to leaver your laundry room in favor of doing other, more important thugs. Maximize your space with the reversible door that can be opened from either direction. Customize your own program with 14 drying cycles and 4 temperature levels to choose from. Cut drying time in half while still minimizing wrinkles, odor and static cling. 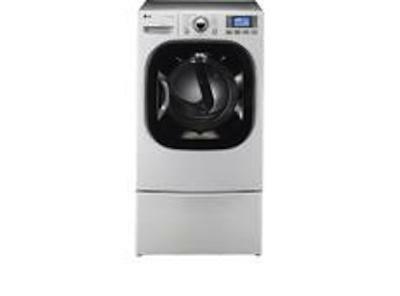 Have one dryer that lasts a lifetime with its stainless steel drum. Less than average number of heat settings that may only be used for basic settings. This dryer is priced above the average based on dollar per cubic foot of capacity which may turn off first time buyers.